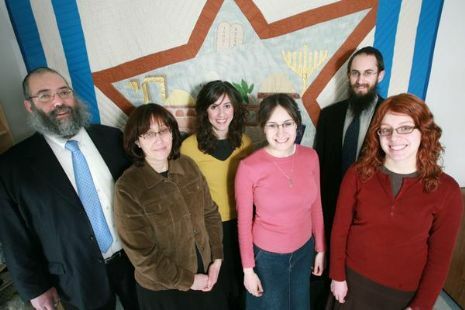 From left to right, Rabbi Chaim Wolosow, Sara Wolosow, Chaya Wolosow, Rivky Blumberger, Rabbi Ilan Meyers, and Yael Meyers, Friendship Circle of Sharon Founders. The Friendship Circle won a $25,000 donation from Virgin Atlantic as part of that company’s promotion of starting service to Boston’s Logan Airport. SHARON - Chaya Wolosow and Rivkah Blumberger are master networkers. The 20-year old Sharon residents spent day and night emailing, texting and calling everyone they knew and many they didn’t know. Their effort paid off exactly as they had hoped --- in the form of a $25,000 donation to a Sharon-based non-profit group. The Friendship Circle of Sharon, which is run by Wolosow and Blumberger, received the sizable donation during a ceremony Wednesday to launch Virgin Airlines new low-fare service from the West Coast to Boston. The group won the grassroots competition sponsored by the airline. In the contest, Virgin Airlines asked Bostonians to nominate their top examples of non-profit groups that are “re-thinking the status quo and changing their own communities for the better.” The competition Web site, www.revolutiontakesflight.com, received over 500,000 visitors in just three weeks. The Sharon charity, which unites teen volunteers with children with special needs, earned 4,259 points to take first place. The group beat out its nearest competition by 739 points. “We knew how much more we could do with our program if we got this donation – we just did whatever we could to win --- it took a tremendous amount of time,” said Wolosow. Thrilled by the victory, Wolosow said she is looking forward to expanding Sharon’s year-old program which is based on the national program of the same name. In the time Wolosow and Blumberger have been running the organization, they have recruited 50-60 teen volunteers and worked with at least 50 local families with children with special needs. One of the organization’s programs called “Friends at Home” has been very successful. Once a week two teenagers visit a child with special needs at his or her home. They play games and do various activities during their time together. “We create a special friendship for the child – and we are building leadership roles for the teens — it is so amazing,” said Wolosow. The Friendship Circle also hosts a bowling league and a program for siblings of special needs children. Wolosow said they plan to start a music circle soon. The organization is run through the Chabad Center of Sharon but is non-denominational, according to Rabbi Chaim Wolosow, the executive director of the Friendship Circle and Chabad Center. The rabbi is also the father of Chaya Wolosow. “The general idea is to extend a helping hand to whoever needs it regardless of religion,” said the Rabbi. He added that he is constantly amazed by the motivation and sense of mission of the group organizers and teen volunteers. “It is very heartwarming to watch them and to see the kind of work being done,” said Rabbi Wolosow. The donation will provide funding for more space and needed equipment, all of which will help the group become more organized, he said. “We were ready to take this to the next level and now we have the backing to do it,” said Chaya Wolosow. Both father and daughter stressed the desire to involve more teens and reach out to help more families not just in Sharon, but in area towns like Canton, Stoughton and Easton.